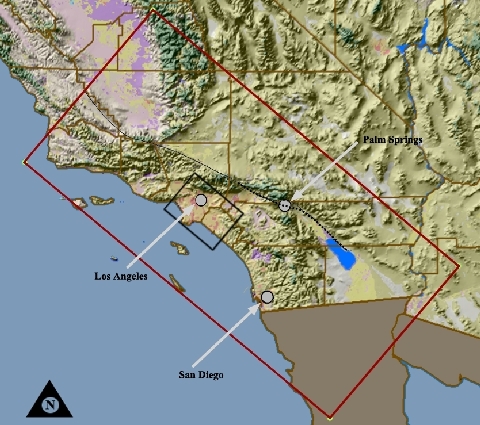 The TeraShake simulations modeled the earth shaking that would rattle Southern California if a 230 kilometer section of the San Andreas fault ruptured producing a magnitude 7.7 earthquake. Two rupture scenarios were simulated, one rupturing from north to south, beginning near Wrightwood, California, and a second one rupturing from south to north, starting near Bombay Beach, California. To model this region, the simulations used a 3,000 by 1,500 by 400 mesh, dividing the volume into 1.8 billion cubes with a spatial resolution of 200 meters on a side, and with a maximum frequency of .5 hertz -- the biggest and most detailed simulation of this region to date. In such a large simulation, a key challenge was to handle the enormous range of length scales, which extends from 200 meters -- especially important near the ground surface and rupturing fault -- to hundreds of kilometers across the entire domain. We created renderings for multiple terabyte size datasets by direct volume rendering using Vista and displacement mapping using Maya.